Cometh cannoli! And in Palermo! This place is a joy for no other reason than it’s resistance to fad. Maybe resistance is its own fad. Sabastiano Salanitro serves Palermo food with gusto. Go figure fave a cunigghiu (fava beans orgenano, garlic, and oil) or vampaciucia c’anciova, which sounds like a vampire sneeze but is actually pasta with anchovies and grapes. There’s also melanzana caponata. 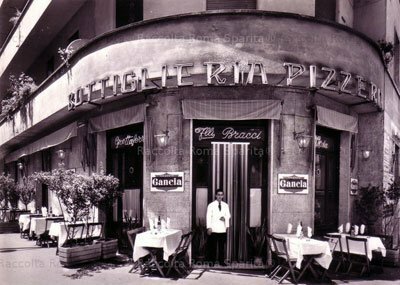 The crowd under the arched ceilings is often composed of Sicilian talking the talk. This is no gourmet paradise but a joyous little find nonetheless. There’s a €20 prix fix menu (wine, water, antipasto, and heaping portions). One Italian recently said it all: Si mangia veramente bene. 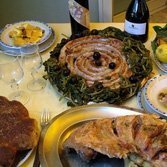 Si mangiano i piatti tipici siciliani. Si spende poco.What else do you need to know? Closed Sunday in August and then for a stretch between mid-August and mid-September.